Last weekend, The International Group for Historic Aircraft Recovery held a three-day conference in Washington D.C. to “review, discuss and debate” the research that has been and will be done to recover Amelia Earhart’s ill-fated Lockheed Electra Aircraft. On the island where she is believed to have died, glass fragments bearing a resemblance to a 1930 freckle-treatment jar have been discovered. As summer approaches, the good doctors at Scientific American will help us keep our skin spot free, but beware the devil…he leaves his footprint on desert isles for reasons subtle and inscrutable. — Rosella Lorenzi, “Earhart’s Anti-Freckle Cream Jar Possibly Found,” Discovery News, 30 May, 2012. —B. 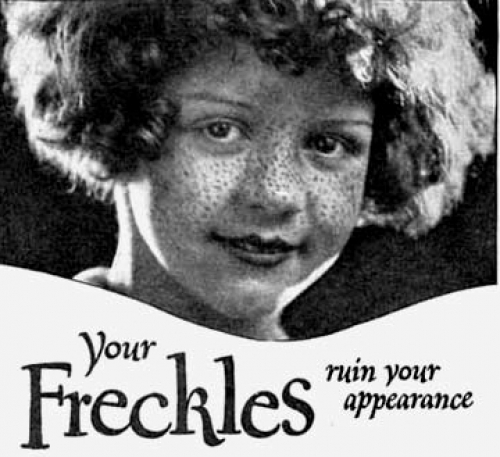 & C. Druggist, “The Treatment of Freckles, Moles, Etc.” Scientific American Supplement no. 507, 19 September 1885. — Daniel Defoe, Robinson Crusoe, 1719. Let Me Recite What History Teaches (LMRWHT) is a weekly column that flashes the gaslight, candlelight, torch, or starlight of the past on something that is happening now. The citational constellations work to recover what might be best about the “wide-eyed presentation of mere facts.” They are offered with astonishment and largely without comment. The title is taken from the last line of Stein’s poem “If I Told Him (A Completed Portrait of Picasso)."